Things I’ve learned, or want to share, about being a home-maker and working to make our home a welcoming place. Should we get a Double Oven Range? Will our Turkey fit? These are the burning questions I turn to when the work day is winding down and the Mommy-taxi service has not yet begun. I may have mentioned that our circa 1977 electric range oven has been on the fritz. And we plan to host a moderately large family gathering this year for Thanksgiving. GE Oven Dials (left) by Bill Bradford used under a Creative Commons License. 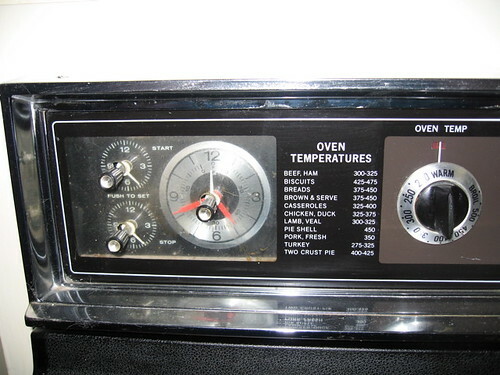 This is about what our control panel looks like, sans the oven temperature recommendations. But, from what I have read (product descriptions of the interior dimensions of the ovens, Consumer Reports, and Online testimonials), I think we’re going to be just fine. 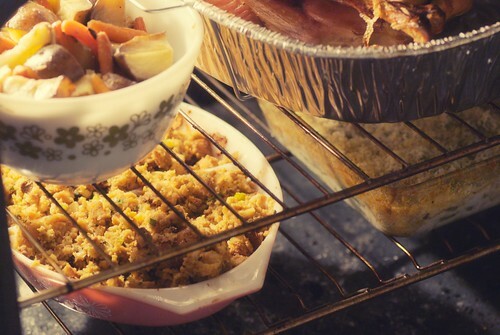 And what a joy to be able to cook the double batch of Sweet Potato Casserole (for UT) in the top oven at 400° F, while the turkey and stuffing are at the perfect roasting temp in the lower oven. So, the shopping begins. I am doing most of my product comparisons online, but plan to purchase from All American Appliance in Monroe. They have been a great company to work with. Shop local, and all that! Addendum: Just found out that All American Appliance now only does service and not sales.